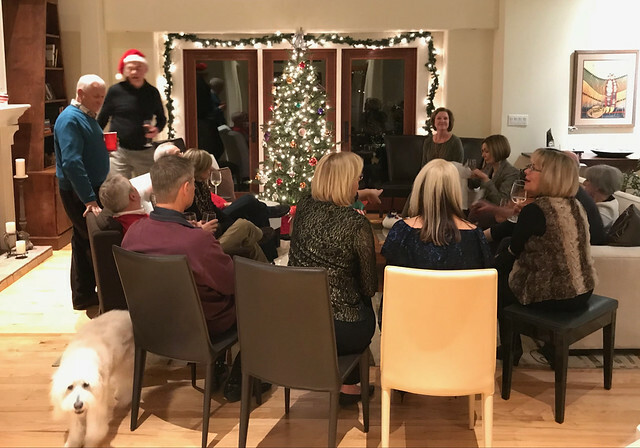 Sharon and I went to the third annual [2015, 2016] progressive Christmas Party in the Deterring Ranch neighborhood. It was slightly different, less ambitious format than last year. The group included: Greg and Mitchell; Jim and Debi; Rod and Kathy; Dan and Debra; Mike and Jill; Tom and Judy; Glenn, and; Sharon and I. The party started the evening at Greg and Mitchell's home for heavy hors d'oeuvre. The evening included an ugly ornament exchange. After the ornament exchange, the group moved to Dan and Debra's for dessert.